The Red Bulls making a late charge. Photo by Jason Schott. 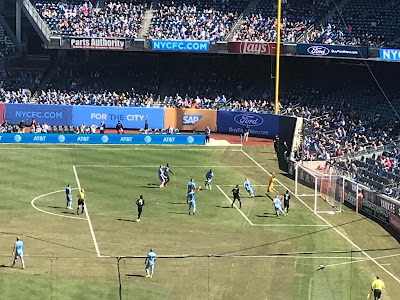 Saturday was a unique day for soccer in the New York metropolitan area, as it essentially was a doubleheader for the local MLS teams. New York City Football Club was at Yankee Stadium to face the Montreal Impact in the afternoon, while the Red Bulls hosted Minnesota United FC at Red Bull Arena in the evening. It turned into a tough day for the local teams, as NYCFC played to a 0-0 draw, their fourth tie of the season, while the Red Bulls lost a tough one, 2-1. The Red Bulls dropped to 1-1-3, with four points. NYCFC also has four points with a record of 0-4-1 as they still seek their first victory. They are in a three-way tie for ninth, which the Red Bulls hold with New England (1-1-4, 4 points) ahead of NYCFC by virtue of their each having a victory. Montreal's Zakaria Diallo with a big chance late. Photo by Jason Schott. NYCFC Head Coach Domenec Torrent made three changes to his lineup for this one, bringing in Ronald Matarrita, Sebastien Ibeagha, Jonathan Lewis and Taty Castellanos, trying to look for a spark after their 4-0 loss in Toronto last weekend. In addition, NYCFC was without midfielder Maxi Moralez, who has a calf injury, and defender Alexander Callens, who is dealing with a hamstring injury. NYCFC’s first chance came early in the game, when Alexandru Mitriță nearly found the back of the net in the first 10 minutes, but his low, goalbound strike was handled by Montreal goalkeeper Evan Bush. Ronald Matarrita perhaps had NYCFC’s best shot of the first half when he, had a big strike from the left side of the box. In the 56th minute, Ismael Tajouri-Shradi was brought on and he made an immediate impact. Soon after he came on, in the 64th minute, it looked like he scored, but was ruled offside. NYCFC got a major break in the 69th minute when Maximiliano Urruti stamped down on Chanot’s foot and was given a yellow card initially, and that turned into a red after a VAR review. This gave NYCFC a one-man advantage for the final 20-plus minutes of the game, as they did not put any significant pressure on the net and could hear some boos when they took too long to make a late push during extra time. Montreal had the best chance late in the game, when Zakaria Diallo fired one over the bar in the 94th minute off of a corner kick. Mathias Jorgensen (25) of the Red Bulls trying to make a play in the box. Photo by Jason Schott. The Red Bulls dominated early, thanks to 18-year-old Danish striker Mathias Jørgensen making his first career start. He had a big chance in the very first minute when he came down the right side and shot it right at the goalkeeper. Jørgensen also had a big opportunity in the 22nd minute when he was on the attack with Bradley Wright-Phillips. 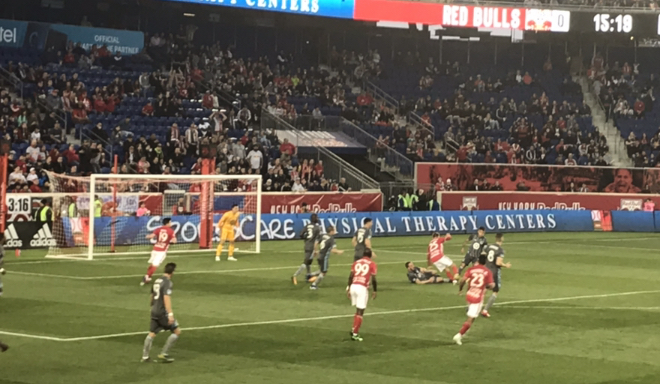 Instead of passing to the Red Bulls' all-time leading scorer, he took the shot himself and just missed by the left post. Speaking of Wright-Phillips, this was his 200th career start as a Red Bull across all competitions. Minnesota began to get some momentum as the first half wore on, and they got on the board in the 34th minute. Romain Metanire came down the right side, fired one into the right side of the box to Angelo Rodriguez, who then flioped it to a trailing Abu Danladi, who buried it to make it 1-0. They doubled their lead in the 50th minute when Romario Ibarra scored unassisted on a breakaway. This was the first appearance for Epps, who was acquired by the Red Bulls via the MLS Waiver Draft. 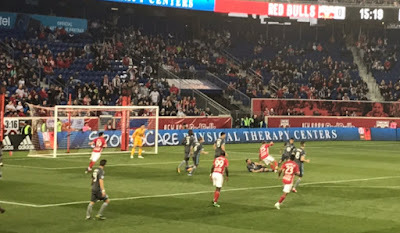 The Red Bulls cut the deficit in half in the 70th minute when Cristian Cásseres, Jr. launched the loose ball, from a diving save by Minnesota goalkeeper Vito Mannone on a Tim Parker shot, back into the net to make it 2-1. This was Casseres, Jr.'s first career MLS goal, and he did it in just his fifth career league match. The Red Bulls put some pressure on late, but they didn't have many great chances to get the equalizer. This was the Red Bulls' third straight loss, and it is the first time they have had a three-match league losing streak since May of 2017. 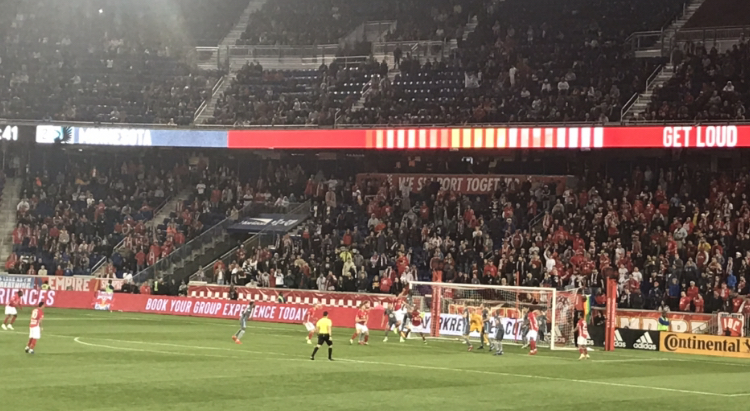 Red Bulls Head Coach Chris Armas said of how his team felt afterwards, "Yeah, look, actually the guys, listening to the guys, there wasn't a lot of frustration. There's not an ability to break down why, but I didn't see a lot of frustration. You're talking about quality, you're talking about certain things that didn't happen, but yeah, there wasn't a whole lot of frustration. Armas said of how they can improve for their next match, at Sporting Kansas City on April 14"I think it's pretty clear, this is the third game in a row, right, that -- you know, can you impose your style of play on the opponent. That's the question going in. So when the other team is giving you so much space and giving you so much of the ball, it's tempting to try to play a bit underneath, right, and then if we're sharper in these moments with the final pass and the final play and getting two strikers and we're running and a bunch of crosses and we go too far and high, yeah, it just builds. But it was there for us. It was there for us, and you could see in the second half that we played a little bit more our way and forced the issue a little bit. Frame the box, get second balls, launch attacks. That was the rhythm, that was the plan. We're going to get there." On how he is coping with dropping three straight games, his first losing streak at the helm of the Red Bulls, Armas said, "Listen, I've been around the game a long time. It's not the first time that I've lost three in a row. I've lost plenty of games. I don't feel I'm coping -- I don't even think about where -- it's just part of the business. I've won a lot more than I've lost, and sometimes they come in bunches with wins and sometimes the losses seem to come around. "You know, I've been a guy and a person that I'm at my best when things get tough. So I think that we'll continue to look hard in how we can help as a staff, but I think the energy with the team and the game plans have been right. I think we're thinking about things the right way. But yeah, appreciate you asking, but I'm good. I'm good. I believe in the team. They give me the confidence and the staff is working hard. Again, I think we've gotten a lot right in preparation, and now the results are going to come our way. They do. "When you work as hard as we do and you see things clearly the way we are and you have guys that stick together and believe in each other and believe in who we are, it makes me maybe sleep good at night. But certainly I'll be working even harder."